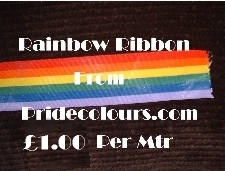 is the best example of Rainbow Ribbon currently on the market. It is very good quality and is perfect for Decoration for Civil Partnerships. It is safe to use outdoors as the Colours will not run. 25mm is Just £ 1.00 Per Meter Upto 6 meters Then The Price Drops To 70p per meter for 6mtrs or more. 34mm is Just £ 1.20 Per Meter Upto 6 meters Then The Price Drops To 90p per meter for 6mtrs or more. P&P per Roll £ 2.00 . Copyright Welcome To PrideColours.Com 2019©. All Rights Reserved.